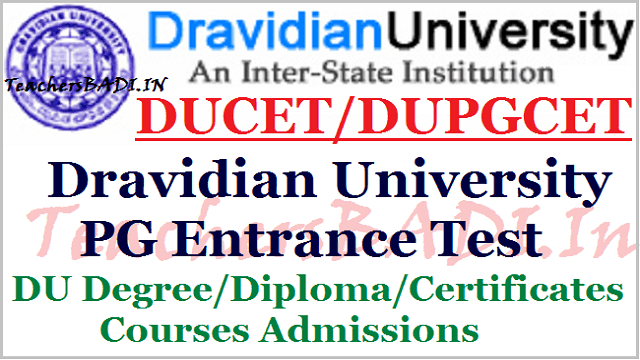 DUCET(PG Common Entrance Test) 2019: DUCET(PG Common Entrance Test) 2019/DU PGCET 2019 Notification, Dravidian University Admissions, Dravidian University PG, Degree, Diploma Courses, Ceritficates Courses Admissions 2019: Dravidian University, Kuppam, Andhra Pradesh state has issued Post Graduate Common Entrance Test(DU PGCET) 2019 Notification for the academic year 2019-2020. DUCET 2019 for admissions into various post graduation courses in the Dravidian University. Dravidian University invites applications in the prescribed form from the eligible candidates who have passed or appearing for the final year examination in qualifying degree for entrance test and admissions in to various pg courses offered by Dravidian University constituent and affiliated colleges for the this academic year. Dravidian University, Kuppam invites applications for admission into UG/ PG/ Diploma/ Certificate courses through Common Entrance Test (DUCET-2018). Candidates appearing for the final year UG can also apply. There is no entrance test for UG/ Diploma/ Certificate courses. 1. Regular Programme: MA(Telugu/ English/ Kannada/ Tamil/ Philosophy/ Linguistics/ History/ Folkore), M.Sc. (Herbal Sciences), M.Ed. 2. Self Financing PG Programmes: M.Sc. (Zoology/ Botany/ Biotechnology/ Chemistry/ Computer Science/ Mathematics), MLISc, M.Com, M.SW, MA(Performing Arts/ Tourism Management), M.Sc. (Environmental Management). 3. Other Self-Financing Programmes: PG Diploma in Folkloristics/ Tourism/ Translation, Diploma in Yoga and Allied Science/ Tamil/ Tulu/ Malayalam, Certificate Programmes in Tamil/ Tulu/ Malayalam/ Academic Writing. 4. Admission in to MCA/ MBA/ B.Ed./ TPT/ B.P.Ed. will be don through ICET/ Ed.CET/ LP CET/ PE CET. candidates who have passed or appearing for the final year examination in qualifying degree during 2018-2019 are also eligible to apply. Selection of the candidates will be done on the basis of common entrance test. Sale of applications: 01.04.2019 to 15.05.2019. Last Date for submission of filled in applications: 17.05.2019. Common Entrance Test for PG candidates: 19.05.2019.